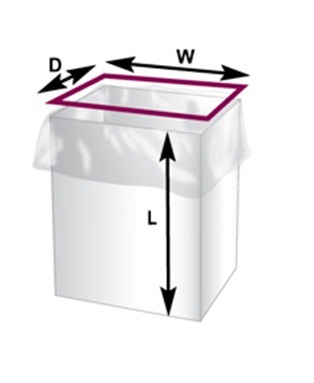 One side of the bag is made longer , allowing the bag to be folded over and allowing items to be easily inserted. A seal running across the bag giving strength to the bag for hanging, usually has a hang hole punched in the header portion of the bag punched in the header portion of the bag. Which end is the opening? How do I measure to line a box? 1) Measure the width, depth and height ofthe box to be lined. The depth should be the shorter side. 2) To determine the Width (W) ofthe bag. add 1' to the width of the box. 3) To determine the Depth (D) ofthe bag. add 1â€ to the depth ofthe box. 4) The Length (L) ofthe bag is determined by adding the depth to the height ofthe box plus 6â€ to allow coverage ofthe box contents. Example: lf the box size is 18â€(wide) x 12'(deep) x 14'(high), the bag dimensions are as follows: Width (W) is 19" Depth (D) is 13" Length (L) is 33"